Secondary cage, Astrosystems spider/holder, Kydex Sold! I have decided to abandon my truss project due to time constraints. 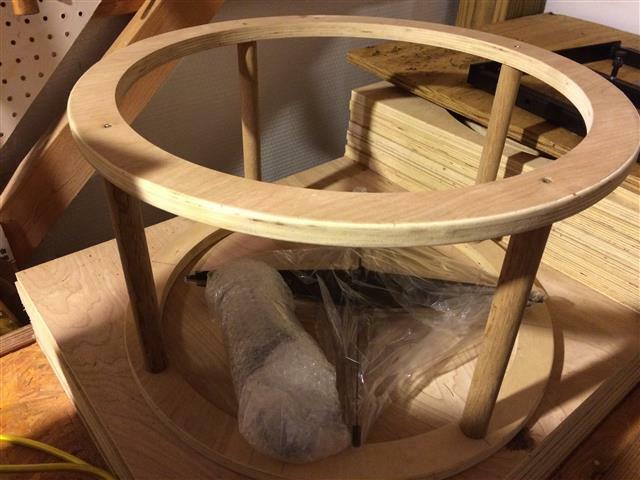 Secondary cage frame made of standard Birch 3/4" plywood (not Baltic birch) and solid oak struts--unfinished. Even though not Baltic birch this is a good grade of ply. Not the 4 or 5 ply stuff I have seen in some of the stores. The struts are not glued to the circles (didn't make it that far) so the screws can be removed to allow for disassembly and easy shipping. The inside diameter of the circles is 17-7/8 inches, and the strut to strut distance is 18-1/16 inches. The struts are countersunk into the rings for strength. 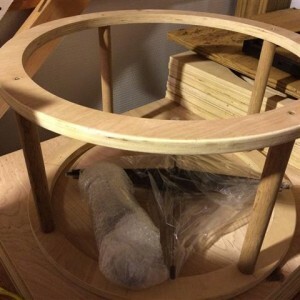 The rings outer edges were beveled with the router. Astrosystems heavy duty spider--style 2--single vane end sized for the 18-1/16 inches strut to strut distance. Astrosystems secondary holder--no tools collimation for 3.1" secondary. Kydex roll--enough to complete the secondary cage assembly. Final reduction: $90.00 for all secondary cage components in this ad shipped CONUS. Paypal or USPS money order. BTW, if you message me please be patient and I will get back to you in the evening. I work long hours. Reminder: Shipping to CONUS only. Please do not ask me to ship outside the USA. Sorry.